WASHINGTON (CNN) -- More than two-thirds of African-Americans believe Martin Luther King Jr.'s vision for race relations has been fulfilled, a CNN poll found -- a figure up sharply from a survey in early 2008. Martin Luther King Jr. waves to supporters from the steps of the Lincoln Memorial on August 28, 1963. The CNN-Opinion Research Corp. survey was released Monday, a federal holiday honoring the slain civil rights leader and a day before Barack Obama is to be sworn in as the first black U.S. president. 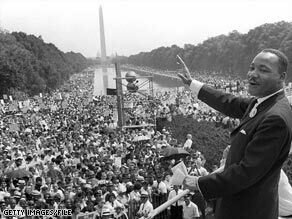 The poll found 69 percent of blacks said King's vision has been fulfilled in the more than 45 years since his 1963 "I have a dream" speech -- roughly double the 34 percent who agreed with that assessment in a similar poll taken last March. But whites remain less optimistic, the survey found. "Whites don't feel the same way -- a majority of them say that the country has not yet fulfilled King's vision," CNN polling director Keating Holland said. However, the number of whites saying the dream has been fulfilled has also gone up since March, from 35 percent to 46 percent. "Has that dream been fulfilled? With the election of Barack Obama, two thirds of African-Americans believe it has," CNN senior political analyst Bill Schneider said. What about the Voting Rights Act, one of the signature achievements of the civil rights movement, which will be reviewed by the Supreme Court later this year? Two-thirds of blacks questioned in the poll say the U.S. still needs the Voting Rights Act today, but white respondents are split down the middle over whether that law is still necessary. In November, a majority of black respondents said that Obama's victory signaled a new era in race relations. The poll suggests that a majority today no longer feels that way, although most blacks predict some improvement on racial issues. "In the immediate aftermath of Barack Obama's victory in November, African-Americans were cautiously optimistic about the future of race relations in the U.S., but some of that optimism has faded since that time," Holland added. In November, a majority of blacks for the first time believed that the U.S. would eventually find a solution to its racial problems; now a majority of blacks believe that race relations will always be a problem in this country. Blacks do believe that the Obama presidency will be good for them -- 61 percent say that the quality of life for African-Americans will improve over the next four years. Optimism for a new era has also dropped among whites. "We saw a burst of enthusiasm about race relations immediately after Obama's election. The initial excitement has cooled a bit. But most blacks and whites still foresee some improvement in race relations," Schneider said. The CNN/Opinion Research Corporation poll was conducted January 12-15. Pollsters questioned 1,245 adult Americans, including 798 whites and 332 blacks, by telephone. The survey's sampling error is 3 percentage points for the overall sample and 4.5 percentage points for the breakdowns by race. All About Barack Obama • Martin Luther King Jr.